I make no secret of the fact that I’m a huge fan of Aberlour A’bunadh and it’s cask strength goodness… and its sherry bomb. This is actually the first 16yo I remember trying, it’s a strange number to see (until recently) because you see a lot of 12 and 18, but not many 16s besides Lagavulin (and until the last few years, Jura and Glenlivet Nadurra). But I figured I’ve had the 12 before (delicious), I’ve had the A’bunadh which has no age statement (also delicious), why not give the 16 a run? The double cask is actually pretty standard for Aberlour. It refers to the two casks in which the whisky are matured, traditional oak (bourbon) and sherry, and their 12, 15, 16, and 18 are double cask matured. The maturation in each type of cask may be different but each of those spends time in both. If you’re into awards, it won the Silver Outstanding for the Speyside category of the IWSC in 2013 and 2014 plus Gold in the 13-19yo single malt category at the 2013 San Francisco World Spirits Competition. My gut reaction to the 16yo is meh. The retail price of this bottle is $74 and my feeling is that you get better value out of Aberlour A’bunadh at $85 and Aberlour 12yo at $58. If you love yourself some sherry, go with the A’Bunadh, it’ll knock your socks off with sherried goodness (and alcohol!). The 16yo will seem “light” by comparison. The Aberlour 12yo represents a better value, the 16 is more refined but not worth the 28% higher price tag. 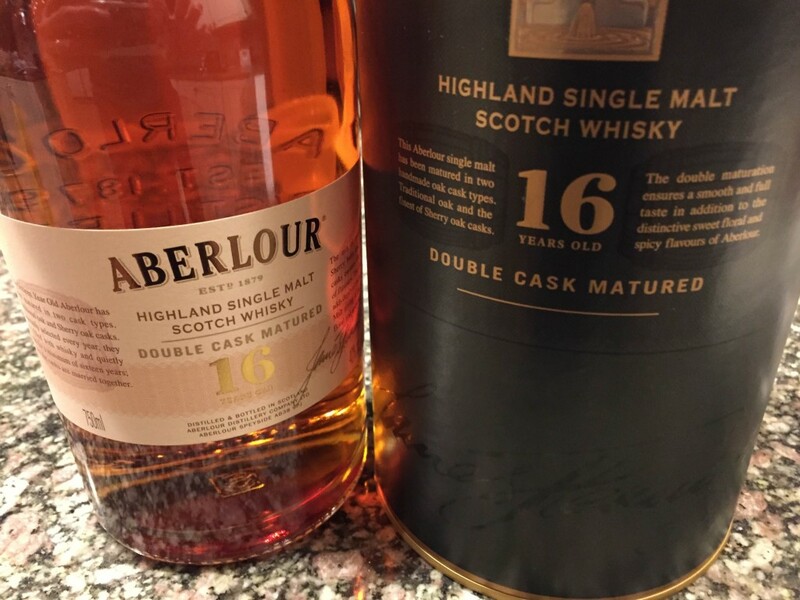 If you want to try Aberlour for the first time, go with the 12yo or the A’bunadh. If you’re a fan already and want to try some more, the 16yo is a good scotch whisky, it’s just not a great price. You get a little more oompf than the 12yo but waaaay less than the A’bunadh. So if you think you like A’bunadh but the sherry was too much and the 12yo was just not quite enough, the 16 is a good middle ground. I think you can’t go wrong with Aberlour — quality for price it’s always good stuff. It was the single that really turned my head and got me involved in scotch tasting. As such, I really appreciate the description of this 16 and the way you relate it to other expressions in the range in price and strength and flavor. I totally agree. How can you go wrong with any Aberlour? I think the 16 yr is a great whisky for introducing new drinkers to Scotch. Have a bottle of the 12yo which is growing on me. Wasn’t a big fan at first but over time it is a nice drink. Have a bottle of the A’bundah which I haven’t opened yet, so I appreciate your description of what to expect. I see nothing but great comments on the A’bundah so once a few partial bottles are gone this one will be opened. Wow. Great job bringing out some early memories for me. I remember being introduced to the Aberlour 12 at my first Scotch tasting. Great Scotch. As for the Highland Park… I just had a flight of HP Scotches tonight. The 12, 15, 18, and the Dark Origins. I can drink the 12 just fine. It’s a bit rough, but that’s expected. The 15 needed a tsp of water. There just wasn’t enough nose on it to enjoy it without the water. I did enjoy the 18. It was smoother. More caramel, butter, coffee. No matter what, going with the Aberlour 12 is a great choice. Great write-up.